Movies, movies, movies… Horror movies are on my mind. And why not? It’s October! The weather is getting cooler (um… kinda, they’re calling for 82 degrees on Saturday) and the weather is getting gloomy. It’s always more enjoyable to sit down on the couch, grab a blanket, and watch horror movies when it’s cold, dark, and rainy outside. 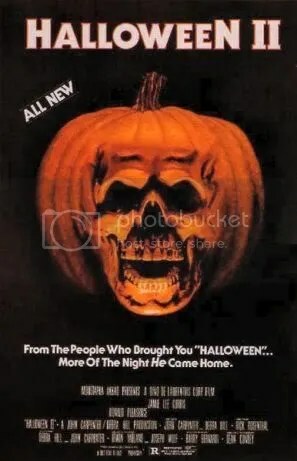 Just like The Retroist is doing, I’m mapping out which movies to watch this Halloween season (yes, I’m giving Halloween a whole season to itself). So in the interest of new content for my blog and just flat out celebrating all things horror, here’s ten movies that *I* will be dusting off from my personal collection and watching this month. How ’bout you? Ah yes, a classic take on the “creepy tall dude kills people with floating knife-balls and shrinks people down to Jawa-size to use for slave labor in an alternate world” story. I don’t think that premise has ever been done any better than in this 1979 horror release. I remember hearing so many things about this movie and just how cool the balls were, but it took me a while to actually pick it up all those years ago. It just seemed so… 70s. Just check out those bell bottoms and Leif Garrett-like hair on Mike! 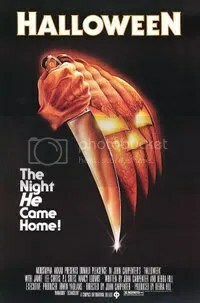 This movie has a killer, creep score right up there with the theme from Halloween, in my opinion. Saw this movie in the theater, and I LOVED it. Definitely a different take on zombies (FYI – I’m a Romero zombie fan), but I liked it. This is the movie that’s been responsible for the zombie-craze from the last few years, which has brought many great things like Robert Kirkman’s The Walking Dead & Marvel Zombies comic books, a Romero/Living Dead comeback, and the surprisingly very good Dawn of the Dead remake. But then we also got many, many bad cash-ins like that wretched “urban” zombie movie Zombiez and Janice Dickinson on season five of ‘The Surreal Life’. I bought the DVD once it came out, but have only watched it once since then. I’ve told myself for the last few years that I need to watch it again and the TIME IS NOW. Geez, does it get any better than this when you’re talking zombies? The quintessential zombie flick! I think I’ve watch this at least once every year since I bought it on DVD (’01? ), I have the U.S. Theatrical Cut release, plus I own the Ultimate Edition set which includes U.S., European, and Extended Cuts. The purposefully done “comic book” look of the zombies (bright green/blue?) is a bit too much for me, but this movie still rocks. In fact, it was so good that Hollywood did a remake and THAT rocked too! Gene Simmons, Ozzy Osbourne, and Skippy from ‘Family Ties’. Who knew it’d be such a winning combination and make one of the best 80s horror movies? I saw a low-budget DVD release of this movie a few years back in Wal-Mart (of course the cover played up Gene & Ozzy’s involvement, even though they really had nothing more than cameos) and promptly snatched it up. Before that, I had seen the movie on a rundown VHS copy that I rented from the video store that I worked at. This movie is just great. 80s, horror, heavy metal, demonic posession, boobies… Ah, what’s not to love? If there really was a Sammi Curr album, I’d own it. Hey, you can’t have Halloween without Young Frankenstein! This movie captures the essence of the Universal monster movies perfectly. While I don’t think its Mel Brooks’ best work (I’d save that for History of the World, Part I) it certainly is a classic comedy that pays homage to the Karloff/Lugosi era. And Teri Garr has never looked hotter than in this film. Okay, a bit of a cheat here with three movies, but they’re all really good and will part of a mini-Hammer horrorfest for me. These three movies were my initial step in the world of Hammer Films and I was quite impressed. A co-worker of mine at the video store always raved about how great Hammer, Peter Cushing, and Christopher Lee were and I finally broke down and put these movies on special order for me to buy and watch. I wasn’t disappointed. I’d say out of the three, Horror of Dracula (titled simply Dracula internationally) is my favorite. There’s definitely a different vibe here than what Universal had put out in the 30s and 40s. Those movies were a slick larger-than-life pulpy kind of horror. Hammer horror was a different beast altogether. It was more violent, gothic, sexualized (wow, lots of D-cups to be found in these movies), and creepy. Kudos to Cushing & Lee for practically single-handedly keep horror alive during the late-50s & early-60s. DUH! The greatest score ever for a horror film. I might even go as far to say this is the greatest horror film of all time as well. I never tire of watching this. Owning it on DVD and AMC’s constant MonsterFest showings of it never spoil my interest. If it’s on, I’m watching it (or at least catching glimpses of it during commercial breaks). Another cop-out, but so what? Ya gotta take the Friday the 13th movies in as a whole, not just by one movie. Granted, Halloween it ain’t. But what’s the big deal? Halloween was the serious, suspenseful slasher movie (at least for the first two installments), but Friday the 13th was a fun, sometimes comedic, gorefest. You watch these movies to see people get killed. PERIOD. You wanna see just what trick Jason has up his sleeve. Will it be an ice pick through one ear and out the other? Will it be a barb wire choker chain? You never can tell. The sixth installment, Friday the 13th, Part VI: Jason Lives, is easily my favorite. It was slick, it was fun, there were good amounts of humor involved, plus it featured two amazing tracks from Alice Cooper: ‘Hard Rock Summer’ and ‘He’s Back (The Man Behind the Mask)’. The great *moment* though of any Jason film is in Jason Takes Manhattan when he punches that guy’s head clean off. AWESOME! The Jason movies were popcorn slashers, and there’s nothing wrong with that… it’s the reason Jason Voorhees is the top slasher in my book. Heck yeah! Before Shaun of the Dead, there was the Return of the Living Dead series! This was the first movie of the franchise I watched, and it just stuck with me for some reason. The first movie and the third are good (although the third and recent sequels have strayed away from the original horror/comedy premise), but for some reason this one really has a warm place in my heart. Could it be the electrified zombie Michael Jackson ‘Thriller’-wannabe moonwalking at the end? Maybe… maybe. Oh yeah, you can’t have a horror movie festival without taking in some of the classics. I can’t divide’em up. This is just TOO COOL to pick only one out. This is an amazing set, even came with cool mini-busts of Drac, Frank, and Wolfie. Universal’s Dracula, Frankenstein, and Wolf Man are all represented here and it’s all an amazing gift for any classic horror fan to have. I ran through all these movies two years ago and hope to do it it again this year. In the interest of making time with my proposed ‘every other day’ Halloween postings, I won’t list all the the titles feature here. But rest assured, it’s sold gold here, baby. All the Dracula films, all the Frankenstein films, plus Universal’s Wolf movies (Wolf Man, She-Wolf of London, Werewolf of London) and even the crossover classic Frankenstein Meets the Wolf Man. Do yourself a favor, if you have the chance to buy these DVDs or watch’em on TV… do it. No movie recommends for this post, just pick any of the above. You won’t regret it!